You won’t find veteran academic superstars in this cohort—at least, not yet. Thanks to special funding from the National Institutes of Health, all the scientists and doctors involved are junior or early-career researchers who have not yet received major grants and are just starting to get their labs off the ground. Those academics, says Sharon Rounds, MD, associate dean for clinical affairs and codirector of the CPVB COBRE, often have exciting new insights into old diseases, but few resources to study them. In academia, that level of organized support is a novel concept, she says. Normally the work involved in lab administration, paper submissions, teaching, and basic research creates an uphill battle for young scientists, leaving little free time to seek grants, develop new lines of study, or form key partnerships with other academics. For that reason, the CPVB COBRE takes some of the administrative weight off of researchers’ shoulders, letting them explore new ideas more freely. Most importantly it doesn’t just encourage collaborative work with peers and mentors, it requires it, building an environment where members of the center sharpen each other’s ideas. That’s an important detail, says Elizabeth Harrington, PhD, codirector of the CPVB COBRE. In the late 1990s, Rounds and Harrington first discovered the value of these kinds of crossdisciplinary partnerships while working together at the Providence VA Medical Center. Rounds, who is a practicing pulmonologist, had an opening in her lab for a research scientist, and when Harrington applied for the job, the two immediately hit it off. The pair also had a geographical edge. Only 23 of the 50 states (and Puerto Rico) are eligible for COBRE funds, which the NIH provides to areas with fewer resources than, say, Massachusetts or California. States like Alaska, North Dakota, Delaware, and Rhode Island are on the list. But Lil’ Rhody had a distinct advantage, Rounds says. Because it’s tiny, it hadn’t gotten the sheer number of research dollars as its neighbors in New England, yet it still supported world-class research and potential collaborators at the VA, Brown, Lifespan health system, and other institutions. In short, she says, it was an ideal place to bring this sort of “research accelerator” to support the careers of young scientists. Qing Lu, PhD, associate professor of medicine, was one of the first scientists to enjoy support from the CPVB COBRE after it was founded in 2013. At the time she was an emerging researcher at Brown, studying the effects of cigarette smoke on the vascular system around the lungs. “Until the past decade or so, there has been a lot of research on the lungs themselves, but not the blood vessels that bring oxygen from the lungs to the rest of the body,” she says. “Cigarette smoke can actually damage the walls of those vessels, creating tiny gaps between the cells.” When that happens, bacteria, viruses, and toxins from cigarette smoke can pass directly into the bloodstream, causing system-wide damage. Fluid from blood can also leak into the airspaces of the lungs, making it increasingly difficult to breathe. Lu thinks her work could one day lead to new treatments for chronic obstructive pulmonary disorder, or COPD—a serious airway disease that affects more than 11 million Americans. But until joining the COBRE, she struggled to find funding. “I got small grants here and there, but only had enough to support myself and a few unpaid Brown undergraduates doing their senior thesis,” she says. In order to establish her lab, she would have to obtain an R01, a major NIH grant that could provide enough funding to support her and several research associates for a number of years. But even being eligible to apply for the funds presented a catch-22: to get it would require presenting proof of extensive prior research, receiving other major grants in the past, and publishing research in prestigious journals—all of which is exceedingly hard to do without prior funding. During her stint at the CPVB COBRE, however, Lu was able to mentor and support a graduate student, hire a postdoctoral fellow and lab technician, and collaborate with Harrington on new areas of work, all while getting additional training to write effective grant applications. After just three years with the COBRE, she had gained enough momentum to finally earn coveted R01 funding, kicking her research into overdrive. She’s since mentored students, published papers in several journals, and become an editor for PLOS ONE. The CPVB COBRE was renewed in 2018 with an additional $10 million grant, and is continuing its streak of research collaboration and mentorship—especially between academics who would be unlikely to work together, like toxicologist Jess Plavicki, PhD, and cardiologist Alan Morrison, MD, PhD. Plavicki, an assistant professor of pathology and laboratory medicine, studies the genes of zebrafish, tiny animals that, when young, have almost completely transparent bodies. Their flesh and skin reveal a clear view of their internal organs, making them ideal for tracking how genetic changes affect their structure. She’s spent years examining the impact of a gene called sox9b, a key element in the growth of an animal’s organs and bodily structures. Using complex genetic techniques, she’s been able to knock out sox9b in zebrafish embryos, targeting only those cells that will become heart muscle tissue. Whether those deformities were similar to any human disorder, however, was unclear, so Plavicki presented her work to her fellow COBRE researchers. When she did, Alan Morrison’s eyes widened. “My first thought was, this is absolutely incredible!” says Morrison, an assistant professor of medicine who studies heart valve disease. 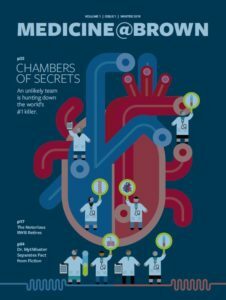 “The images reminded me of a disorder called Ebstein’s anomaly,” a defect that connects two normally separate chambers of the heart. In severe cases, it can cause heart failure, arrhythmia, enlargement of the organ, and other major problems—and since it’s congenital, most of the patients affected are children or young adults. Collaborations that are focused on basic science—the sort of high-level exploratory research that Plavicki and Morrison are conducting—are an essential element of the CPVB COBRE. But the center’s ultimate focus is to find applications for that research: new ways to treat or study disease. Beth Harrington and Corey Ventetuolo RES’07, MD, a specialist in pulmonary and critical care medicine, already have begun to develop methods that could shed light on an understudied and rare disease: pulmonary arterial hypertension (PAH), high blood pressure in the lungs. It’s caused in part by a fault in patients’ endothelial cells, which form the lining of their pulmonary arteries. Somehow those cells start to grow erratically, forming cancer-like lesions that expand into the vessels themselves. The reason PAH is not well understood, she adds, is that it’s incredibly hard to get access to pulmonary artery endothelial cells from PAH patients. At the moment the only way to obtain them is through an autopsy after a patient has died, or from lungs removed during transplantation. But those cases only represent cells that are in the end stages of the disease, not ones that are just starting to develop into lesions. Thanks to CPVB COBRE funding, Ventetuolo and Harrington are exploring a different approach that uses an existing routine procedure. In order to get an accurate reading of pressures within the heart and lungs, doctors must snake a catheter down into them through a major vein in a patient’s neck. On its end, a tiny balloon inflates and deflates, measuring the pressure in the right heart chambers and blood vessels. In the process, however, that catheter inevitably sloughs off endothelial cells as it slides through a patient’s arteries. Ventetuolo and Harrington are working to harvest the cells stuck to it when it emerges. They’ve already developed a way to test each cell to confirm if they’re involved in the disease, and are creating new ways to expand those cells’ numbers in the lab. As the CPVB COBRE program progresses, Rounds and Harrington have taken time to reflect on their own collaboration. Unlike today’s participants, they didn’t have much in the way of mentorship; just a handful of loosely connected scientists and physicians they could trade notes with over lunch. Thanks to the COBRE, however, they’re ensuring that some young cardiopulmonary researchers in Rhode Island don’t face the same struggle. Instead, these scientists have an unparalleled launchpad—one that helps grow their individual research, while creating a family of other investigators that can grow alongside it. That legacy goes far beyond Brown. In addition to supporting investigators’ labs, the CPVB COBRE is funding small pilot projects—sort of “proof-of concept” trials to test new research ideas. It’s providing support to researchers at the Providence VA, Lifespan hospitals, and the University of Rhode Island, among other places—and offering a springboard for them to successfully apply for other funding.